It's a film that played for months on end in France, sparked a duster fashion trend in that country, and made Charles Bronson an icon in Japan. Of course, the original American theatrical release was truncated and failed to find success at the box office. Also check out 1973's My Name is Nobody (Il mio nome è Nessuno); a great sister film to Leone's masterpiece also about the death of the West only set in a later period. 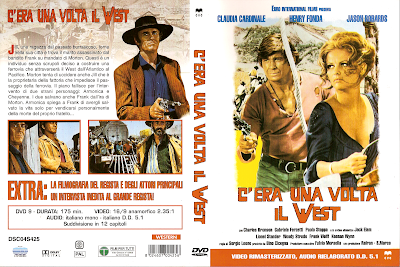 This Italian DVD runs about seven minutes longer than Paramount's DVDs (see this write-up on the differences I wrote for DVDBeaver). Although anamorphic, the only audio option is an Italian dub. Certain sequences, like the McBain family massacre, are interlaced. Detail is weaker than the Paramount disc, but the color is more appropriately "dusty" by comparison. One of my favorite movies of all time. I didn't know anything was cut from the Paramount release so I'll have to seek out this one.